Common terns are colonial nesting seabirds: white with a black cap, gray back and wings, and a black-tipped red bill. In New York City, they nest in Jamaica Bay. But for about the last seven years they have also been nesting on the decommissioned piers at Governor’s Island, Manhattan. Since 2013 NYC Audubon has been monitoring that colony. In New York State they are classified as a threatened species. Conservation threats include habitat loss, disturbance, and flooding. In 2013 we discussed doing some enhancement of the nesting sites on the piers to provide better support and protection for the eggs. 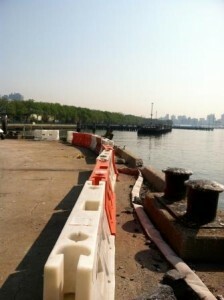 This year we made our first site visit of the season to Governor’s Island on May 22. If we wanted to do any habitat enhancement work, it had to be done immediately: the terns were returning and starting to build nests! We are currently only permitted on Lima Pier because the other two piers are not safe for human access, so the habitat work was to be done there. A group effort made the habitat enhancement work possible. The Harbor School generously donated oyster shell, and shell crunching was done by heavy machines under Jim Reed’s direction at Governor’s Island. 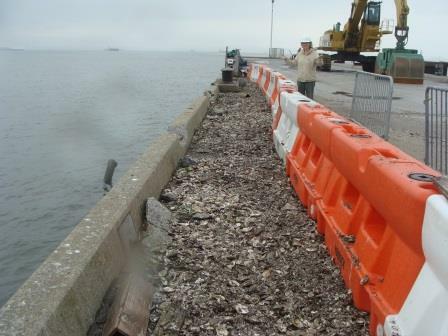 We spread the shells to about a 3” depth between the edge of the pier and the barriers—enough to provide a buffer between the eggs and the hard concrete. By the time we were done moving the shells and admiring the newly created habitat, the birds had already returned! A few days later, National Park Service volunteer Annie Barry spread some hay (thank you Marisa Dedominicis and Earth Matter!) on the shells for the birds to use in their nest building. On June 22, we returned to Lima Pier to work with the terns. NYC Audubon Finance Director Barbara Lysenko and NY State DEC biologist Barbara Saunders joined our bird banding team for that day. What we found was awesome: 32 common tern nests – three times the number of nests observed at this time in 2013 before habitat enhancement! A true measure of success. Our team banded four chicks with federal and field-readable color leg bands. We also banded 14 adults. Common terns have high fidelity to their nest site. We found two (out of four) birds we had banded on Lima in 2013 had returned to the pier. A third previously-banded adult was not one of ours: this bird had been banded in Argentina! We are in the process of contacting the bander so we can learn when and where that bird was tagged. 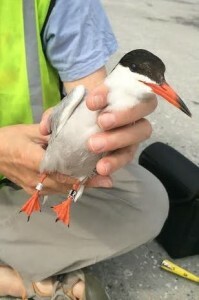 Keep your eyes open for common terns sporting black leg bands with white digits — they could be the terns from Governor’s Island.